No more driving around in old model cars. No more being stuck driving cars without the latest safety features. No more riding around in cars without the latest technological gadgets. No more having to sell a car that began to depreciate the moment you drove it off the seller’s lot. That’s what you get when you lease a car instead of buying one. 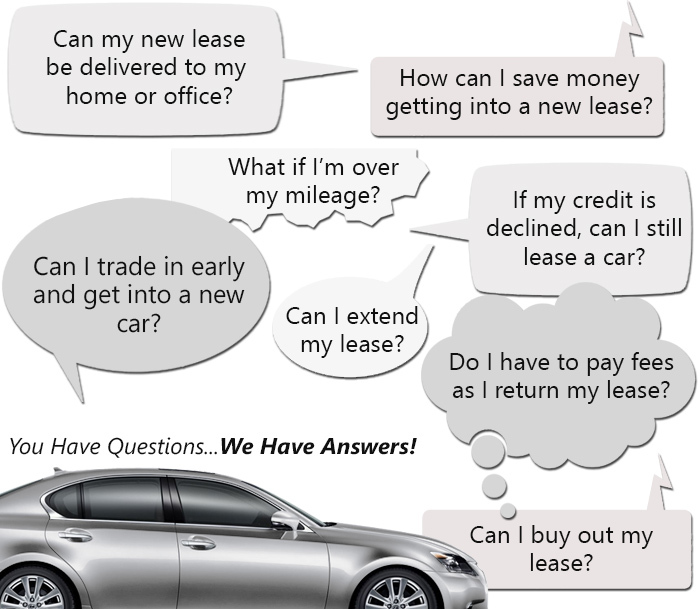 Leasing definitely makes sense. Finding the right company to lease from has already been done for you since you’ve found this website. We’re the car leasing company that can offer you the largest, most comprehensive variety of vehicles to choose from, all at the lowest prices around. And when you lease from us, you’ll have not only the most convenient leasing experience possible, but you’ll get customer service that will keep you smiling. When you found us, you found the car leasing agency that can offer you any type of vehicle you want, from cars of all types (convertibles, coupes, sedans, etc. ), to trucks, to vans and minivans, to SUVs and other sorts of off road vehicles. We’re able to lease you any new model vehicle made by Acura, Audi, BMW, Buick, Cadillac, Chevrolet, Chrysler, Dodge, Ford, Honda, Hyundai, Infiniti, Jaguar, Jeep, Kia, Land Rover, Lexus, Maserati, Mazda, Mercedes-Benz, MINI, Mitsubishi, Nissan, Porsche, Ram, Subaru, Smart, Toyota, Volkswagen, or Volvo – and we’re able to lease them at the lowest prices around. The reason we’re able to do this when other companies can’t comes down to one big difference between us and our competitors: instead of having a physical car lot, we have a virtual one. Our car lot is solely online, ready for you to access any time you want. Why this matters and makes such huge differences in our inventory and prices is because physical lots are finite in size. A physical car lot only has so many parking spaces, and those spaces mark the limits of the number of vehicles they can lease to you. Those lots are also expensive, coming with a price tag that includes property costs, property taxes, insurance, utility bills, payroll for the people who work those lots, and so forth. In other words, they’re paying more – a lot more – for less. We don’t have bills like theirs, so our overhead is low, and because our overhead is low, our leasing prices are low as well. And our virtual car lot is always the perfect size that allows us to offer you all of the vehicles made by the manufacturers listed above. Not only are our competitors paying more for less – and charging you for their bad business model – but the way they do things makes for an awful leasing experience on the part of their customers. When you lease from them, you first have to find a ride to get to their lot. Then, some salesman will follow you around that lot as you look over their paltry selection of rained-on, sun-beaten cars, and will do his best to get you to sign up for one as quickly as possible so he can collect his commission and get to lunch. If high pressure sales tactics are your thing, then lease from our competitors. But if you’d prefer to look through a car lot from the comfort of your own home, we’re your choice. When you lease from us, you can kick back at your place, turn on your computer, and surf through our huge inventory of cars at your leisure. No driving around, no sales tactics, no pressure. Bring your family and friends along to go car shopping with you by emailing to them the vehicles that interest you, getting their opinions on your selections, all without having to coordinate schedules and arrange rides. Do your car shopping any time of the day or night, from Sunday to Sunday, holidays included. Leasing a car simply can’t get any more laid back and pressure-free! If you have any questions about our vehicles as you’re touring our virtual lot, we’re just a phone call away, ready with the answers and with any help you might need. We’ll help you, too, when financing time rolls around, after you’ve found the perfect car. We’ll work directly with banks and other lenders to make sure you get a really good deal with great terms. We aim for – and are good at getting – low interest rates and low monthly payments for our customers, even if they think their credit isn’t so hot. Don’t give up ‘til you let us try! We’ll e ven handle most of the boring paperwork so you won’t have to! Then comes the day when you get your keys and take possession of your new car. Don’t bother worrying about how you’ll arrange to go pick it up! We’ll bring your car right to you – to your home, office, or most anyplace else that’s convenient for you that day. We go way out of our way to make sure our customers can take things easy when they lease from us! Give us a call if you have any questions for us! Our number is 718-412-3436! We’d love to meet you and have the chance to show you how we can save you lots of money while offering you a huge – the largest! – inventory of vehicles to choose from, all at the lowest prices around! And we promise we don’t skimp on customer service as you’re enjoying the most laid-back, convenient car leasing experience possible! Car Lease Staten Island is operated by the country’s leading digital lease company, so we have high standards to live up to!